Like other camera makers Olympus are concentrating on high-end models to distinguish them from the more capable camera phones. Viewed from the front, top and rear this new compact camera even resembles the firm’s popular OM-D E-M5 mirrorless model. It doesn’t have interchangeable lenses but it features an 6-64mm (28-300mm equivalent) f2.8 constant aperture zoom lens, which is longer than most rivals in this category while still being regarded a high-speed lens even if it’s slower at the shorter end. 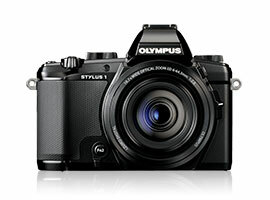 Like other models aimed at enthusiasts it has a 12-Mpix 1/1.7” type (5.6 x 7.4mm) BSI CMOS sensor. 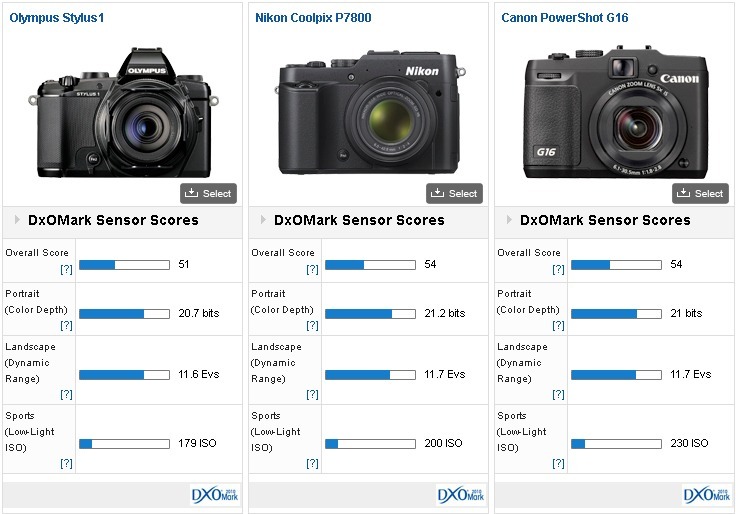 Although not as large as the 1” type sensor found on the Sony enthusiast compacts and the Nikon 1 mirrorless models, the 1/1.7” is larger than most found on digital compacts. 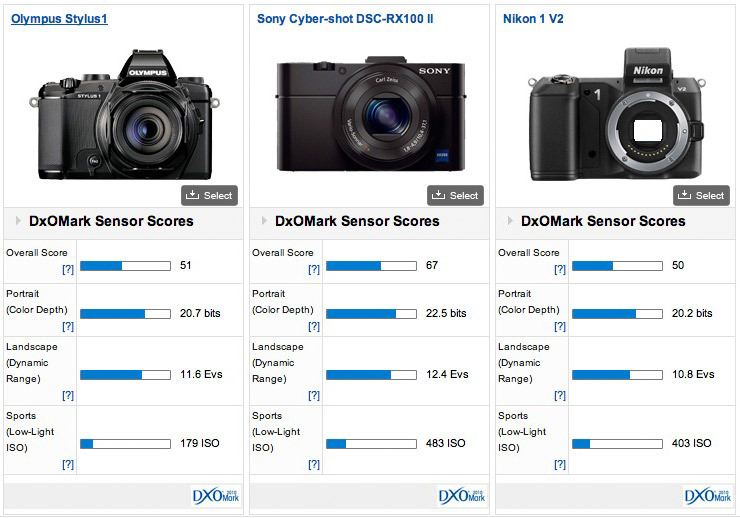 The Stylus 1 achieved a DxOMark a score of 51 points putting it in 16th place against sensors smaller than the 4:3 types and 203rd in our overall sensor rankings. That places it on a par with models such as the older Fujifilm FinePix X10 but also newer models such as the Nikon 1 AW1 and the Panasonic Lumix DMC-LF1. Aided by the BSI architecture, it has good color depth at 20.7 bits and the dynamic range of 11.6 Evs is impressive at base ISO. Low light capabilities are relatively promising for this size sensor and pixel pitch but a score of 179 ISO is on the low side and it’s a long way behind the larger surface area 1” type sensors found in the Sony high-end compacts, such as the Cyber-shot DSC-RX100 II. Pitched against rival offerings adopting what we assume to be the same or related Sony sensor in the case of the Nikon Coolpix P7800 and a similar size, possibly Canon fabbed, CMOS sensor in the G16 the Stylus achieves very similar but not quite identical results. In real world terms you’d be hard put to tell them apart. In the lab though the Stylus 1 has slightly lower color sensitivity than the Nikon of around -1/3 of stop, due to a slightly higher noise floor. The dynamic range is similar but the slightly high noise means the low-light capabilities lag behind the Canon model by -1/3 of stop. The Stylus 1 has marginally higher noise levels in the lab compared with the Canon particularly though the differences between them wouldn’t be noticeable in ‘real-world’ use. 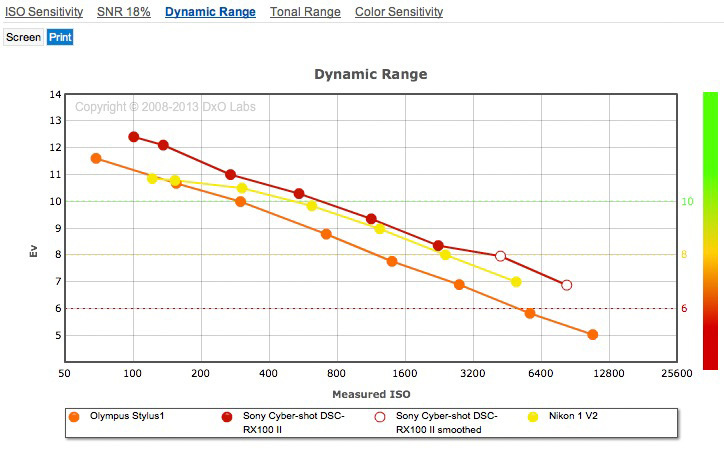 Dynamic range is similar to the Nikon however, the Canon has a slight advantage, and not just at base ISO but at higher sensitivities as well. Needless to say the results are close. The Sony Cyber-shot DSC-RX100 II and Nikon 1 V2 mirrorless camera which both use a 1” type sensor with 2.7x surface area of the sensor in the Stylus 1 make interesting comparisons. The Sony is quite remarkable and even more so when compared with the Nikon. Not only does the Sony have an additional 4-Mpix over the Nikon it has a much higher color sensitivity and a significantly wider DR. The Nikon struggles to outperform the Stylus 1 at base ISO, although it has superior low light capabilities of just over a +1-stop improvement in sensitivity. The Sony is even marginally better than that. 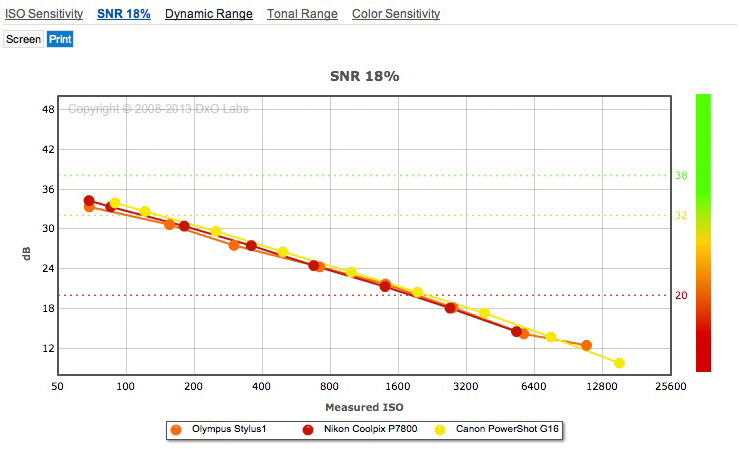 The Stylus 1 has excellent DR at base ISO compared with the larger sensor in Nikon 1 V2, but it can’t compete with the RX100 II and both sensors outperform the Olympus at higher ISOs. 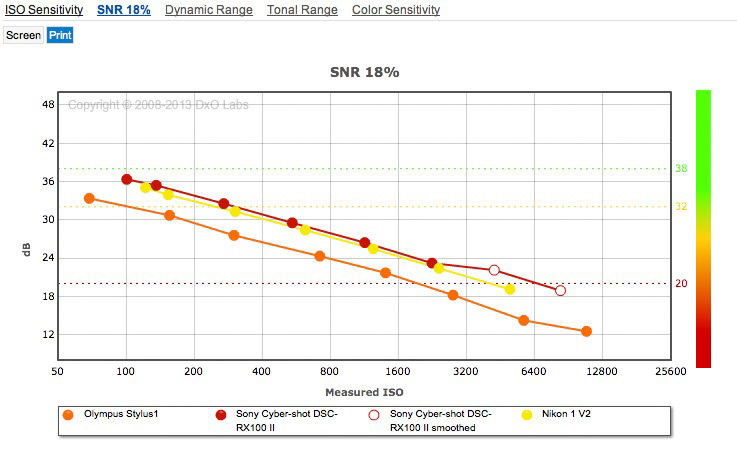 Both the Sony RX100 II and Nikon 1 V2 sensors have a superior noise response compared with the Stylus 1, but that’s hardly surprising. 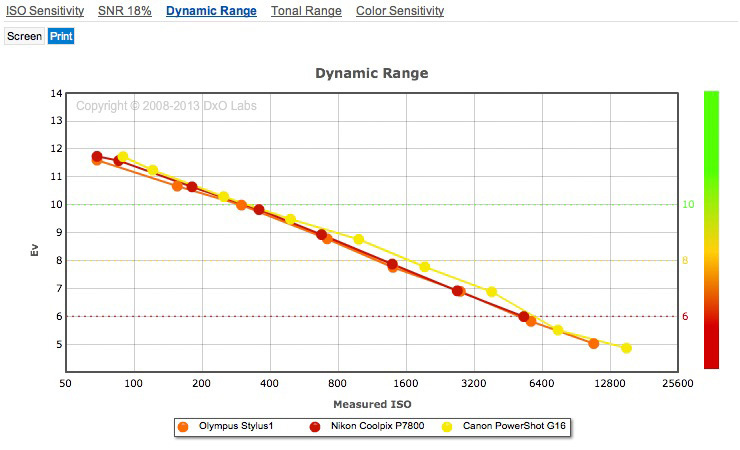 The sensor in the Olympus Stylus 1 compares favorably with other models using similar sensors, notably the current Canon PowerShot G16 and Nikon Coolpix P7800. Both those models are cheaper by around $150 but the Olympus has the more promising zoom lens as well as benefiting from a built-in EVF, like the Nikon. It’s also relatively small and portable but it’s overshadowed in IQ when compared with the Sony RX-100 II, particularly at high ISOs. Until rivals adopt similar sensors, that model remains the reference by which other compacts are judged. Even so, there’s no denying how compelling the Stylus 1 is when judged as a whole.